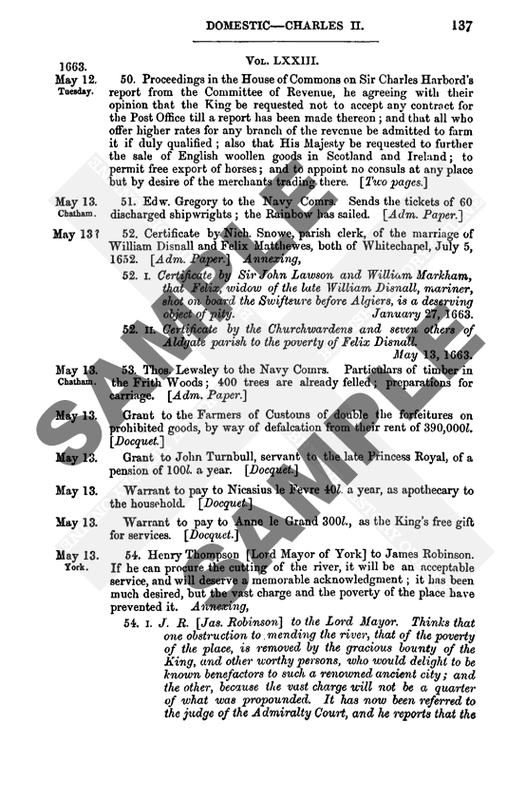 Calendar of State Papers Foreign: Elizabeth, Volume 18, July 1583-July 1584. Originally published by His Majesty's Stationery Office, London, 1914. 269. [Cavaliere Vergerio] to Cobham. The faith and confidence which I have in you compels me to communicate to you the enclosed, which I desire that, when read and shut up in your most secret and sincere breast you will return to me, having from it understood the state of the case. And truly, if I were not compelled to depart for Switzerland, as I wrote lately, and am mounting my horse this day, I should have crossed over thither. But please God, I shall return as soon as possible, hoping to find your letters here, on a matter so important that I do not think it ought to be neglected or disregarded. You, with your most prudent judgment, will consider the rest more deeply.—Paris, 26 November, 1583. This must be dated old style, as he encloses letter of Nov. 24—Dec. 4. 270. Ottaviano Cornari to Cavaliere Vergerio. I believe you will have so much faith in me that notwithstanding my negligence, you will believe that I have not forgotten you. I have performed if not all, yet the greatest part of your instructions, and they were accepted as willingly as I rendered them, especially by Signor Antonio Querini, who now loves me more than before, from regard to you. I wished to accompany the letter to your brother by one of my own, to show my desire of repaying his favour to my father in Istria, shown according to the courtesy which the Cavaliere Vergerio uses in all his affairs. For all which favours I am for ever bound to him. The ambassador will give you the news of the world. To yourself only, and to no other, I may say that with my arrival from England, the desire for friendship with that crown was aroused in many, so that if her Majesty were to send some honourable person to treat of the differences about navigation and trade under any pretext she pleased, I know certainly that it would be easy to maintain him as ambassador, in which case this Republic would be excused by all if it accepted the courtesy offered it; and the Queen would lose none of her reputation through the affection and favour shown by her to those less than herself. I wished to write this to you, because I have heard that one of our gentlemen, who went to kiss her Majesty's hands, brought back word that she was willing to send a Catholic ambassador whenever this Republic should like. I beg you to speak or write to Sir Henry Cobham, adding or suppressing what you think good in order to save time. Meanwhile do not forget that I am your servant, and as desirous of employing myself for you as any man can be. Please commend me to the English ambassador, whom I embrace with all my heart, not forgetting the wrongs of Signor Tiburtio and still more, those of the doctor.—Venice, 4 December, 1583. Postscript erased.—Nor should I wish to be named in this matter as having exhorted you to it. For the rest, do as seems good to you. I was too true a prophet touching Alost, for we have assured news that Capt. Pigot, Capt. Taylor and some others have delivered the town to the Prince of Parma. Persuading the rest that the only way to relieve their necessities was to drive out the Walloons (presuming they had store of victuals in their quarter), they last Wednesday put their men in arms, and while most of the officers were busied against the Walloons, Capt. Pigot, with such as he had procured for the purpose, seized one of the gates and let in the enemy. Part of the Walloons, on the first alarm, broke open a gate in their quarter and saved themselves, others, being surprised, are yet in the town. How they are used we have no certain news, but there is a bruit that they are to march to Ecloo, and that as many as will serve shall have a month's pay. “These disasters had not happened to our troops if Mr. Morgan had not been won to separate himself and undertaken to break the companies, but these are the fruits, to command disavowed people and such as, what villainy soever they do here, a man can have no right of them at home.” I pray you write to the Prince and States to use us well upon our retreat, or divers of our captains will “he by it.”—Antwerp, 26 November, stilo Anglie, 1583. Yesterday were performed the “funerals” of Cardinal Birague. There was no such pomp as was expected, the greatest number being friars and penitents, who gave greatest honour to the ceremonies, being many in number, and the most known (or at the least thought) to be Princes of the Blood and great personages; the King himself being present, and the body supported by the Princes of the Blood in their penitents' weeds. The principal mourners were led by Princes, after whom followed the Court of Parlement and the chiefest of the city. The King and Queen are returning in a day or two to St. Germains, from whence the King means to go to Dollenville to see M. Joyeuse. It is thought they will return before Christmas. Certain news is come to-day that the Duke of Savoy will never have a child and cannot live long, whereon the Duchess of Nemours is gone to her husband, “with intent to draw nearer unto him than they have done.”—Paris, 27 November, 1583. Postscript(autograph).—You shall hear more at large of me by Painter. 273. Capt. Roger Williams to Walsingham. “I am sorry to write you these news. Although the world knows the misery our men were in, yet the humour (?) of these people cannot be satisfied after so villainous a fact. Although their dealings was most ungratefully without reason or honesty, yet the villain the serjeant-major [Pigot] with the rest might a respected the honour of his nation and a thought of Mr. Norris, besides a number of captains and poor gentlemen which are undone by his treason. “Two months ago, being in Alost, the sergeant-major with the captains and a number of officers came to my lodging, told me resolutely to get me out of the town, and go to the Prince of Orange and to States General, to show their misery and not to return without money. Passing by Antwerp, with much ado I got them fourteen days' victuals. At Dort I found the Prince and the States. The General [Norreys], after seven days soliciting, got a letter of them to the Gantois to pay us 6,000 guilders, which they had promised long before that was plain money, for they knew the Gantois resolution was to rase Alost and not to part a penny out of their own town. “There we remained a month, protesting their misery. In the meantime the serjeant-major sent two captains with the letter to Ghent. The Gantois answered they had no money for Alost, saying ' we would the town were afire and all you bound fast in the midst.' He sent also two captains to protest to Antwerp, who were answered coldly. They sent also to Dermonde (Dermunt) to borrow four days' victuals till these came from Antwerp, which must pass through Dermonde; Ryhove denied them. “In the mean time the false man dealt with the enemy. The night the General and we arrived at Antwerp he despatched presently captains and a gentleman to 'courage ' the garrison, and to tell them how he was arrived at Antwerp, and to send them contentment presently. By reason of hard passage he played the villain three days afore they arrived at Dermonde, nevertheless Defficke, the quarter-master, the day before the enemy entered, came with Sohey the governor afore the gates, showed them how the General was at Antwerp and to send them contentment presently. The villain, thinking his dealing with the enemy was not to be pardoned, forgot his honour. “I dare show deceived all the rest of his countrymen therein saving some five or six, as the report for truth is now; which was himself, Captains Smith, Doulton, Vincent, Thos. Taylor. If God give me leave to come to your honour's speech, I will show you some things, and [you] will confess we have been hardly dealt withal.”—Antwerp, 7 December. 274. The Prince of Chimay to Walsingham. With note signed Jaques de Gryse, grand bailiff of Bruges and of the “pays du Franc,” that his Excellency having fallen ill since the writing of the above, has asked him to sign it on his behalf. 275. Pietro Bizarri to [Walsingham]. The people of the clergy and Chapter of Cologne being at the siege of Hultz, a place belonging to the Elector Truchsess, he with the Count Neuenaar and other confederates determined to go to its aid, and having reinforced his army, and some succour being come to him from Guelderland, he marched towards the enemy, and having engaged with them, after some resistance, defeated them in such manner as there remained dead more than a thousand and as many more taken prisoners, besides the baggage and 300 carts, so that they not only gained the victory but a great booty besides. Amongst others, they are said to have taken a Count of the Chapter and the Probst (Prost) Gant, who has done much evil to the State. There were many Albanians, Spaniards, Italians, Walloons, and indeed the flower of the Prince of Parma's army. Some write that the lancers did not wish to engage, but that suddenly the reiters began to attack the enemy. However that may be, this victory is considered of great value and also of great consequence for the regaining of the whole State for the first Elector, which may it please God to bring about. Now they are said to have laid siege to a place called Dorsten, belonging to the Electorate, which is strong both by nature and by art, and moreover has held itself neutral, as has Andernach and some other places of this State, waiting to see which side will be favoured by fortune, as is said. Here, on St. Andrew's Day [new style], by common consent of the magistracy, M. St. Aldegonde was appointed principal consul, or, as he is vulgarly called, burgomaster, of the city, a man who by his learning, judgment, experience of affairs and integrity of life is most worthy of every honour, and I particularly rejoice at it as he is my very good friend and lord. He has been summoned to Bergen-op-Zoom to quiet the mutiny of the soldiers in garrison there; and to put all in good order, money is sent to satisfy them as to their pay, so it is hoped all will shortly be arranged. If those soldiers were not lovers of the good cause, that most important place would already be in the hands of the Spaniards, by means of the great promises and offers of the Duke of Parma, in the name of his King. But God has inclined their hearts to the love of their country and to what may result to his glory. With all this, there is very bad news from Alost, a place of no small importance, which is said to have been given to the enemy by the English and Scots who were in garrison there, against the will of the Walloons and Flemings who were with them. This loss, if such it be, is esteemed of great importance, both for the situation and the strength of the place; yet we must still hope that God will help us in other ways. It is said that the Sieur Latremoglia [qy. La Mouillerie] and Sieur Asselier are to be sent from the States to Monsieur in France and that an entire agreement will be come to. Quod felix faustrumque sit, et prosperiori eventu quam hactenus contigerit. Count Van den Berg, formerly Governor of Guelderland and brother-in-law of his Excellency has been carried prisoner into Holland, some say to the Hague, with his wife and children. By the perfidy of this gentleman, the province of Zutphen (Sutfen) was lately lost, and most likely Guelderland will shortly be lost also. Such is the power of Spanish gold ! You will already have heard of the new plot of the King of Spain against the Prince of Orange, by means of this same gold. I pray God to protect him from it.—Undated. Nov. 29 (? ), Dec. 9. 276. Batista Servigi to Captain Tomaso Sassetti, London. About ten days ago I wrote to your honour, and if I had thought that you were not perfectly informed of the strange and evil adventure which befel the island of Terceira, I should long ago have given you a clear discourse, as one who knows the truth not only concerning the proud enemy who gained the unexpected victory, but also as to the defenders, both French and of other nations. The first cause was the Count, the Viceroy, who, like a fool, made many mistakes, but the loss of the island only happened through two Portuguese companies, who were guarding an impregnable place, which not only those 120 men, but two men with two pikes were sufficient to defend, seeing that it could only be entered by one man at a time. The enemy, favoured by the weather, the moonlight, the mist and the noise of artillery, firing of harquebuses, sounds of rattling and shouting after the Turkish fashion, hastened to put on shore ten galleys with 5,000 men. By chance, with a harquebusade, they killed an ensign of those Portuguese companies, who seeing this, like draggled hens (galline bagnate) ran away (it still being before daybreak) and entirely abandoned the place without leaving a man to guard it. In that place, where there was a dangerous spot, I had made an entrenchment of earth, with good ditches, and a French captain, by name Captain Borgognone, with only sixty men, defended it so well that the enemy made no entry at that point, and there the said Captain Borgognone died, in the place of the Portuguese. Near which, my company and other succours beginning to arrive, found the enemy entered with two ensigns and a great multitude of soldiers, Spanish, Portuguese and German. Our Maestro di Campo coming up with two other captains and seeing the danger, retired with my company a little way to certain natural walls, thinking to do better there, but worse followed, for all the rest of Borgognone's company left their place and retreated to the Maestro di Campo, whereupon the whole of the enemy entered and were in force before the rest of our succours, little by little, could arrive. They being all come, we engaged the enemy, and sustained their attack from morning until evening, fighting all the time, so that they did not gain a foot of ground. And although they say that we were more than they, this is false, the truth being that the French were not more than 1,200, and the Portuguese, good and bad animals together, only about four or five thousand, and one might give the devil two-thirds of them. The enemy were, both by what they say and what we could judge, about 14,000, excellently armed and experienced men, while ours were young, badly armed, and little accustomed to military exercises. With all this, the enemy made a great mistake to land where they did, for they were walking into a sack, but fortune favoured them, and they have reason to carry themselves proudly, for victory is always a thing to be praised. Our retreat to the mountain was well done, as in any other place our men would have all been slaughtered. There we received overtures for a truce from the enemy, which was long debated before it was concluded, and if we had not lacked provisions of wild pears and apples, and that gradually the Portuguese had almost all gone to surrender themselves, and ours left with about 200 killed and wounded, and our arms broken or lost, we should still have hazarded something against that evil faction. To sum up, Terceira is lost by ill-fortune, caused by the malgovernance of the Viceroy, and by the proud and unskilled Portuguese, and they have suffered and will suffer the penalty thereof. I am grieved for the distress of this poor Prince [Don Antonio] that he is so devoid of aid, and that the powers are not willing to espouse so just a quarrel; but rather all the world does the best they know for the tyrant, in order that under such a monarch every one may be able to govern himself and live by tyranny too. Meanwhile I, as duty demands, wherever I am believed and listened to, do not fail to stir up men's minds to unite and act together, if not offensively at least defensively. I know, or at any rate suspect something, therefore be on your guard against taking the voice of the people for the voice of God. . . .
At this point I have received yours of the 7th of last month, which is most welcome to me, both for the true love I bear you, and for the news which it gives me of Signor Landi and Signor Mannucci. I am sorry not to give you a more complete account of the affair to show to our friends, but I hope on a better occasion and perchance with the help of a true plan to tell you the whole more particularly, and you will then understand that the enemy did not gain the victory by his military skill, but by diabolical craft, not to say by our sins, because God is displeased with tyranny, hypocrisy, pride and all other great crimes. But there is need to bestir oneself, and I am well and more desirous than ever to work. I know not if priests or friars (very similar scoundrels) may not have had a hand in it, but I know well that one friar, unworthy to live, has said often enough that he knew not whether all would not be governed against my judgment [sense of this passage doubtful]. Here it is considered certain that the affairs of Flanders are going on badly, so far as can be seen. De la Croce is arrived very ill, having come all across Spain on foot, leaving Signor Minucci and me, without any ground, to come in company of a Frenchman, not without great danger, all caused by his unreasonable suspicions and fears. . . .
From Italy they write that the Pope is preparing to go to keep Lent at Bologna, where they prophecy that he will die, and I hope before he goes there. It is also said that the Turk would very willingly seek to aid the afflicted, and to defend them from the Spaniard on any slight occasion, provided that he is called upon to do it from here, or by any other powerful Prince or Republic, and the belief is that even Monsieur has begun to wake up. Here, any private persons may do some little thing in favour of this poor King, that is, as a corsair, but I do not know that they may not do just the contrary as is their custom, though it is not credible. They do nothing but have processions and penances and prayers, imploring the aid of God Almighty, a thing truly praiseworthy and right; whether we are heard, time will show. I was forgetting to say that at Terceira, according to credible information, about 800 at least of the enemy were killed. I was in company with Don Pedro di Toledo and the Count of Ladron, who gave an account of it, to this effect. There was a Cordelier appointed, with twelve pressed from the gallies, who confessed that day to have buried 600 Spaniards, killed at the skirmish, not counting the wounded or those who died of disease, or were killed by our artillery in the gallies. And I assure you that of ours there did not die a hundred and about as many wounded, as the enemy themselves have babbled, so that if those two Portuguese companies had held that place half the eighth part of an hour, the 5,000 Spaniards disembarked with their principal leaders would not one of them have escaped being killed or made prisoners, so that the fleet would have been half defeated, and the Marquis [Santa Cruz] would have returned with empty hands (le trombe nel sacco). After the whole of the enemy's army had entered the country, we sustained the hostile attack all the day, never losing a foot of ground, and they retired to their main battle before we did, but because in the evening our Portuguese companies almost all retired to the mountains, half disbanded, we were forced also to resolve to withdraw to some safe place, and truly it was for the best that we determined to go to a mountain, for the towns are all without walls and without provisions, and could not have been defended, so that we should all have been cut to pieces, especially as the said Portuguese never wished to join with us, and went “a baciare il babbuino.”—Paris, 9 December, 1583. 277. Edward Burnand [sic] to Walsingham. I arrived at Flushing on the 29th and presently went on to Middelburg, where I understood by Mr. Gilpin that St. Aldegonde was gone to Antwerp with all his family, to be one of the burgomasters there. I have delivered your letter to M. de “Hautin,” Governor of this place, and informed him concerning the party you know of. He thanks her Majesty and your honour for your care of them, and knows the party very well, whose brother is one of the chief pensionaries of this town, well known to be a papist and a very suspected person. Hearing that Mr. Norris is at Antwerp, I have sent him your letter, and asked him to tell me whether he will be shortly in Holland or not. I have sent him a copy of the article concerning the service our nation has done in these countries and the small respect made of them, desiring him to let me know whether I shall deliver it to the Prince or not, considering what has fallen out by our nation at Alost, who, by the practice of Captains Pigot, Taylor and Smith, have delivered the town to the enemy for 10,000 crowns to them and four months' pay to the soldiers, who will either be entertained or given free passage to Dunkirk and so to England, which latter is the course most of them mean to take. After I have despatched with the Prince, I mean to go to Antwerp to Mr. Norris, and to deliver your letter to St. Aldegonde. M. de Buzenval departed for Calais ten days since, but M. de Pardailhan is with the Prince. “Written hitherto,” the Governor sent for me and told me that M. de Segur [-Pardailhan] is gone for Denmark, and that Buzenval was left sick here and is gone for France. Also that Asseliers and Murrey [la Mouillerie] are being sent from the States to France, but that unless the King showed himself an enemy to Spain his brother would not be accepted here. To all he said I made “little or no repetition"; as far as I can tell, he is not unliberal of speech. Ortell should be looked to. He hath not “stick” to write hither that Hawkins is come home with the worth of 800,000 crowns, and hath touched also on some particularities of Scotland and the reconciliation of Don Antonio with the Spaniard. I embark for Holland presently.—Middelburg, 30 November, 1583. Yesterday I received two of your letters, one by the post, the other by Mr. Burnam, to whom, as you desired, I have given my advice and aid. As M. d'Aldegonde is at Antwerp, we repaired to the Governor Haultain, who was in this town, and there your servant dealt with him privately as he will tell you. He goes this afternoon from Armewe towards the Prince, and sends Mr. Norrys his letter to Antwerp. He will find good conveyance for the letters to M. de Pardailhan and Buzenval at the court by means of Mr. Villiers. The party of Cologne departed thence on the 17th and I look for him daily. God send him in safety! We understand now that A lost was delivered up by themselves, not a little to our grief and Mr. Norrys' disquiet. They were agreed with for four months' pay and, if reports be true, Captain Pigot, the chief worker, has 10,000 crowns. His complices were Captains Dalton, Taylor and Smith and Lieut. Acton. Pigot and Taylor brought in the enemy ere the soldiers certainly knew of the agreement. They “should have” passport to go for Dunkirk and England, but as yet we do not hear further. The enemy is otherwise quiet in Flanders, only troubles the passage by Rupelmonde from the castle, so as those that travel to Dermonde or Brussels pass not without danger. This week there has been skirmishing along the Flanders coast, but no great matter passed. We hear that those of Barrow are quieted by two gentlemen sent from the Prince with four months' pay. The States meet again on the 15th of the next, stilo novo, at Delft, and hope to conclude to good purpose, which God grant, “for surely the provinces do much dislike and fear their estate if God do not provide better than by worldly judgment can be comprehended.”—Middelburg, 30 November, 1583. Those of Antwerp granted a contribution of the fifth penny towards payment of the Barrow soldiers. Messieurs Asseliers and la Mouillerie (Molerie) are appointed to be sent to Monsieur, but it is thought will be stayed till the States assemble. The licence to carry victuals to the enemy is still tolerated and anew granted. It is said that M. de la Noue shall be set at liberty for M. de Champagny. At the last defeat by Meurs, the governors of Limburg and Ruremonde were taken prisoners. Postscript.—Since ending the above, “he of Cologne” is arrived, and after I have dealt with him, if I find his matter is of the importance he has affirmed, I shall despatch him over by the first sure passage. 279. Col. Morgan to Walsingham. Recommending Captain Wilson, a man worthy to be countenanced both for his sufficiency and for the service he has done, as will be seen by the Prince of Chimay's letter on his behalf. The English at Alost, having long been in mutiny, are now upon terms to surrender it to the enemy, as Captain Wilson will tell you more at large. Touching your command to have nothing to do with Mr. Norris for his challenge, I have sent to acquaint him withal and to know his determination, but have had no answer, and so am forced to stand upon my guard, “ready in mine own defence rather to despatch him than to remain continually in hazard of mine own life.”—Bruges, 10 December, 1583. 280. Mathew Morgan to Walsingham. Having so convenient a messenger, I take occasion to put your honour in mind of your servant, and to certify to you such small actions as have here fallen out. Mr. Norris's regiment is “in great terms of mutiny” at Alost, and the country says they have given the town into the enemy's hands for a small sum of money. “ For certain they have put forth the garrison of Flemings and Walloons, to the number of four ensigns, and caused their drum to sound in their garrison to hold all for the enemy, so it is thought if it be not gone already it is like it will shortly, for they have agreed with the enemy for 27,000 guilders, but as yet they stay, for the States of Ghent hath offered 27,000 guilders, but they have directly answered them that they shall not seek unto them under their first demand, which was four months' pay. The soldiers of Bergen-op-Zoom are still in mutiny. They are offered six months' pay by the State of Holland. They have in their jurisdiction 400 sail, “which makes the enemy to be very busy in proffering great sums.” Bruges, 10 December. 281. Jacques Surys to Walsingham. Not wishing to infringe your command of yesterday not to return to you, 1 make bold to advertise you that last Wednesday I saw very often going in and out of your lower chamber a post who took away two Jesuits in this town. He is a man of middle height, lean face, black beard, wears a hood of dove-grey colour and large cloak of russet (? roinaslre). John de Vigues knows him well, and I am certain that he has brought plenty of others. I also beg you advertise her Majesty, that if she is pleased to send letters to the King of Navarre, I hope by God's favour to put them speedily into his hands, after having delivered those letters you gave me for the ambassador, and I pray you to do me the favour to honour me with your commands. 282. William Lyly to [Stafford]. Yesterday afternoon, too late to send my boy to Paris, I had this ticket of H., by which your lordship may understand the news of “Montroyal.” I have stayed till this morning in order to confer with the rest. Repairing last night to Mr. Chass[incourt] he told me that he had news out of Languedoc, but nothing of this, and thought it to be untrue. His news was that one Mr. Boysayson, a very valiant gentleman in the town, seeing the besieging forces lying aloof, issued out and overthrew divers, whereupon all the rest are gone their way. Ha. also tells me that the King blames Montmorency as the cause of all this; but H. says the King of Navarre avows it to be done by those of the Religion, for that the King gives them no justice and uses them ill in all things, and that he cannot stay them from such enterprises, and clearly excuses Montmorency. It is thought at Court that Montmorency is suborned by the King of Spain. I understand here that Lord Paget and Charles Arundel went two days since towards Germany. The King will to-morrow have the States' full resolution concerning the gendarmerie. It is said that above 4,000 officers will be cut off. Maineville (Maninville) is, as H. saith, gone secretly from hence, and a ship laden with men is come from Dieppe. Chass[incourt] says for certain that he embarked for Scotland at Eu (Heux) in Normandy. As it seems, matters are yet but in their beginning and therefore your lordship may the better prevent them. The Duke of Bouillon was yesterday marvellously well received of the King, but returned in the afternoon. Postscript.—This morning word is come to the King that Marshall Joyeuse (Gwoyes) has “segid” Montreal, but Marshal Danville has come and lifted it, and “tene” the artillery and slain many men. Monsieur has given out three score commissions to his men of war; the King borrows 120,000 crowns of the town of Rouen to send to Marshal Joyeuse, for he is marvellously offended with Montmorency. This day he sits in council on the affairs of his gendarmerie and declares he will have resolution of it on Thursday at latest. 283. Answer of the Judge of the Admiralty, concerning Woulters and Hauzman. Seeing that the States of the Low Countries have made intercession for the release of John Woulters and Nicholas Hauzman, “as being of them,” there is no cause for the lord ambassador of Spain to be so importunate on their behalf. Nevertheless, it may be said to him that as the said Woulters and Hauzman have chosen to appeal to the court of Chancery, being the ordinary method both in the Low Countries and in this realm, they ought to content themselves with that course, chosen by themselves, without troubling her Majesty, the lords of the Council, or yet the said ambassador. 284. Reply of [Mendoza] the Ambassador. Copy of the above answer of the Admiralty judge, apostiled with the reply of the ambassador, to the effect that whatever the rebels calling themselves the States of the country may write, it is sufficient that he, as minister of the King his master signifies that the suppliants are good subjects of the said King, and as such he assists them, it appertaining to all sovereign kings and princes to pardon their own subjects if they please, however grievously they have offended. As to the second point, the said subjects of his master seeing the terrible injustice and wrong done to them by the judges of the Queen, would be very foolish, if after imploring his help according to their right they should allow themselves to die in prison without appealing, which is a sufficient reason for not proceeding in such causes. For in the same way matters may be carried on in the estates of the King his master against the subjects of the Queen as soon as those whom she has declared rebels shall give action by letters or other instruments against her subjects. It is he who ought to be offended, seeing that for six months he has been demanding an answer from the lords of the Council whether or no they hold William of Nassau with his adherents and party as rebels against the King of Spain, who declared them to be such many years ago by proclamations which have constantly been renewed. 1. This endorsement must be old style, as Bizarri (using new style) speaks of St.Andrew's day [Nov.30] as already passed.